With so much to do and see in San Francisco, let Explore California make it easy for you! Our Best of the Bay Tour will get you to those "must-see" spots, and bring you to some local gems that only locals know about. A ride on the cable cars? You bet. Strolling across the magnificent Golden Gate Bridge? Obviously! A redwood park without the crowds of Muir Woods? Absolutely. An oyster-shucking lesson and a tasting of locally made cheeses and sparkling wines? But of course! We'll take care of getting you there, getting you in, and getting you tapped into the secrets and insider's knowledge that make this one of the world's most fascinating destinations. 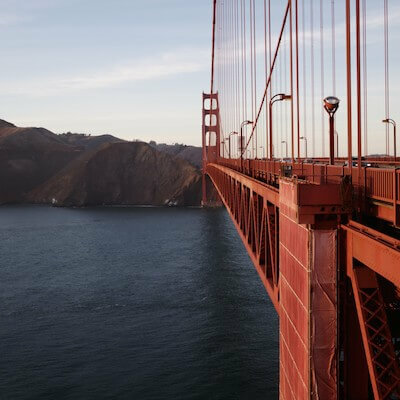 The Golden Gate Bridge, Sausalito, cable car rides, secrets of Chinatown and Fisherman's Wharf, redwoods, oysters, scenic ferry rides, and more! You'll start our tour with an iconic San Francisco experience: an exhilarating walk over the Golden Gate Bridge. *** Drive through the Marin Headlands for jaw-dropping views of San Francisco and the bay. Visit the Marine Mammal Center, view sea lions and seals, and learn about efforts to protect these incredible animals. Have lunch in Sausalito and stroll along the waterfront. Get a close-up view of the floating homes of Sausalito's houseboat communities. Marvel at the engineering feats that made life in and around San Francisco possible at the Bay Model. Relax on a scenic ferry ride from Sausalito to Fisherman's Wharf. *** This day includes a 2-mile walk across the Golden Gate Bridge, but you are welcome to stay with the van if you would prefer to not walk that much. You'll still be able to get onto the bridge even if you don't walk all the way across! Stretch your legs on a walking tour of North Beach, Little Italy, Chinatown, and Fisherman's Wharf. 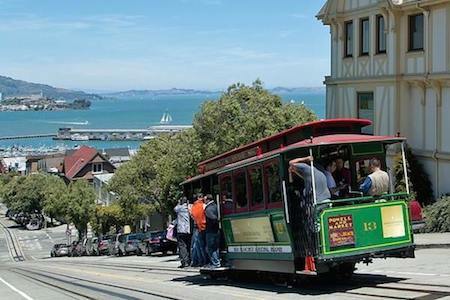 *** Ride to the top of Nob Hill on a cable car and learn all about this San Francisco icon at the Cable Car Museum. Stop at the top of Lombard Street and experience the "crookedest street". Stroll through the colorful streets of San Francisco's vibrant Chinatown. Have lunch at Washington Square Park, in the heart of North Beach. 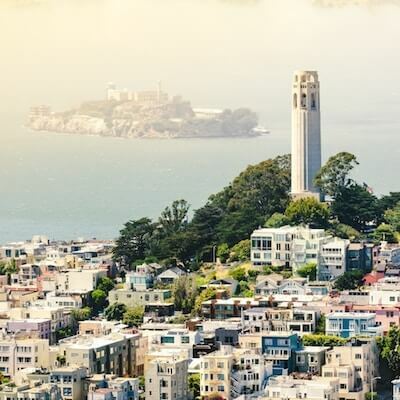 Enjoy the panoramic views and fascinating murals at Coit Tower, then follow the garden-lined Filbert Street steps down to the Embarcadero. Learn about life on board an authentic World War 2 liberty ship--one of only two remaining--on a tour of the SS Jeremiah O'Brien. Finish the day exploring the delightful oddities at the Musée Mécanique. *** Throughout this day of the tour you can expect to walk about 2.5 miles in total, including one fairly steep descent down stairways. We will also use public transportation to connect parts of the city--your transport fares are included in the tour cost. If you prefer not to walk as much, we can help you to arrange transport to connect the dots. Avoid the throngs of people at Muir Woods and let us spirit you away to a quiet grove of towering coast redwood trees. You'll experience the majesty of the world's tallest trees without the crowds of Muir Woods. Sample artisanal cheeses and pastries in the quaint town of Point Reyes. Enjoy an oyster-shucking lesson and picnic on the shores of tranquil Tomales Bay. Delight in a tasting of sparkling mead at a local winery. Take in the splendid coastal views on a scenic drive along Highway 1 all the way back to San Francisco. We offer two accommodation packages for our Best of the Bay Tour. Prices listed are per person. For our Superior package, the per person price is based on occupancy. Rooms on this tour are single (one person per room) or double (two people per room) occupancy. Please note that the rooms booked on your tour may not be identical to those pictured below. 2 nights at the Hotel Zephyr (4-stars) in the Fisherman's Wharf district of San Francisco, in Standard King or Double Queen rooms. Please note that breakfast is not included in this package. We would be happy to arrange breakfast for you at an additional charge of $21.50 per day per person. This package may not be available for every departure date. Arrange your own accommodation in San Francisco, and meet us for each day of the tour. Please note that if you choose this package, you will need to arrange your own transportation to the meeting point for each day of the tour, and will also need to arrange transport back to your accommodations from each day's drop off point. The pickup/drop off location for each day is in the Fisherman's Wharf district. Light snacks to enjoy in our vehicle. Our San Francisco Bay Area Tour departs from San Francisco on Sundays and Wednesdays. Browse the calendar to view available departure dates. Take a closer look at some of the spectacular places you'll see on our San Francisco Bay Area Tour!